I contacted the European Baptist Federation a few months ago as the migration became prominent news around the world. EBF personnel worked to clearly identify specific ways funds could be used well in addressing the crisis, because we wanted the money to be used to support local Baptist ministry. The need arose in south Serbia, but declines in giving to the Texas Baptist Hunger Offering made it impossible to free up extra dollars for the project. So, I called a dear friend, Jackie Baugh Moore. Within 48 hours, the Baugh Foundation had approved the $15,000 gift. It is hard for the CLC staff to express our deep gratitude to the Baugh family and to Baptists around the world. The Baugh family has expressed great generosity through the years in supporting various Baptist efforts. And our connections with Baptists around the world made it possible to address needs through specific Christ-centered work. 1) Improve efficiency in international crisis aid by allowing more food to be bought in or near the country where it is needed and by reducing sales of American-grown food in developing countries and instead funding local projects that can provide more sustainable anti-hunger efforts. 2) Enhance the nutritional quality of food aid and better target it to vulnerable people, such as women and children in the first 1,000 days of life. 3) Protect funding for emergency and development food aid. 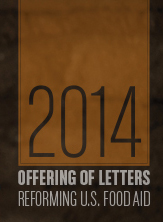 Bread, which is supported by the Texas Baptist Christian Life Commission, provides a wide variety of helpful resources to help people understand the issues related to U.S. aid and to help churches organize letter-writing campaigns. It’s a great way to lay a foundation of concern for hunger and poverty in the world, and this concern is firmly rooted in the gospel message of Jesus. Take a bow, Texas. You deserve applause on the issue of childhood hunger. Three years ago, Texas ranked second worst in the nation on this critical issue. Today, we’ve climbed to 11th. We still have much, much work to do, but that is great progress. Jeremy Everett, director of the Texas Hunger Initiative, announced the new ranking at the Southwest Regional Hunger Summit at Baylor University Wednesday, Oct. 17. The first summit was held three years ago. The Christian Life Commission launched THI and there is a direct correlation between creation of THI and the improvement in Texas. 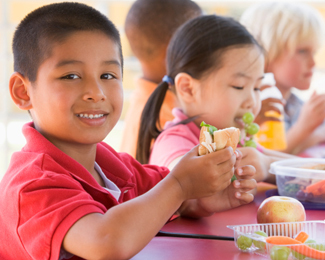 THI has worked with the U.S. Department of Agriculture, Texas Department of Agriculture, statewide non-profits, food banks, and local groups to organize the response to hunger. Many people are not aware that the USDA administers the federal government’s various food and nutrition programs. It does this because SNAP (Food Stamps), Summer Meals, and other programs are directly connected to and benefit the nation’s agriculture culture and industry. There are two public benefits of these efforts — providing for people in need and keeping our agricultural infrastructure sound. As a result, it was USDA resources that have been critical in the Texas turnaround. “We were leaving billions of dollars on the table because we did not have a coordinated system,” Everett said. In other words, federal dollars approved for various programs were not being accessed. All of the groups mentioned above, led by THI, have created processes to improve access to those funds. “You invest in the poorest people in your community,” and they “have to immediately turn around and spend it” because their needs are so great, Everett told me. Those dollars are spent in communities, and it is estimated that one-in-10 working class grocery jobs are attributable to government programs, he said. So, we celebrate. Hunger is being reduced, jobs are being created, and our communities are being improved. Now, we shoot for continuing to climb the latter. Please pray for a famine relief team we have in Ethiopia. A video camera has been confiscated and officials are jittery after a BBC report from the refugee camps. Pray that God will give them the needed access to help relief dollars flow effectively. And pray that the camera will be returned. Tabitha Foster, Sara Gomez Robison and Trese Hill Foster like this.